It's the new craze in western countries, this sinful dessert which is a combination of a doughnut and croissant. It's deep fried like a doughnut but the ring shaped dough also has layers. And layers mean more fat which is placed between the layers! These are medium sized cronuts from Theos, a bakery in South Mumbai. Must be at least 350 calories each although one cannot be sure how much fat is actually used inbetween the layers. A plain doughnut is usually around 200 calories for a medium sized one. 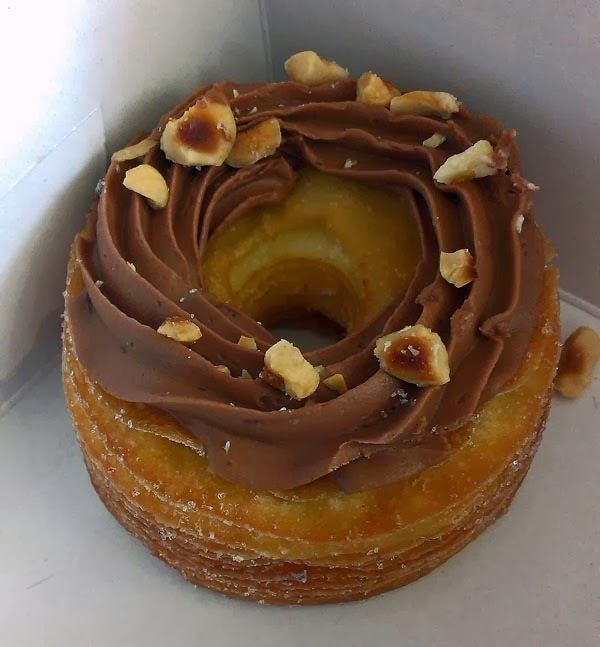 A cronut is one of the worst high calories culprits. Pure junk. While sugar, white flour in abundance plus far too much fat. Mostly refined oil used for frying. Theos says they use butter for the dough not margarine, but most bakeries used margarine in their bakery products and margarine contains the dangerous transfats. It's a hydrogenated fat and bakery products found in supermarkets in India all contain this. Causes the arteries to clog. Best make your favorites at home, using butter. A close up of a cronut. 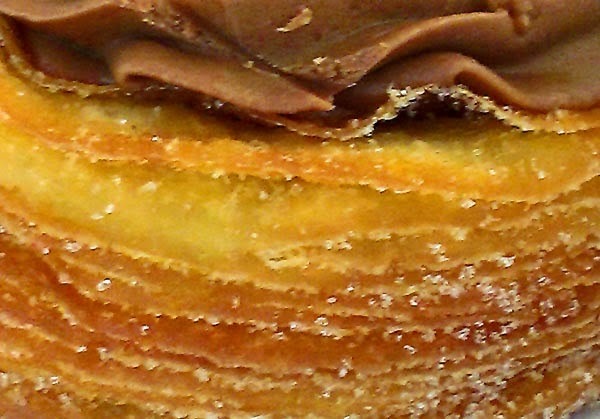 Layers lined with fat and glazed with sugar and chocolate cream on top.